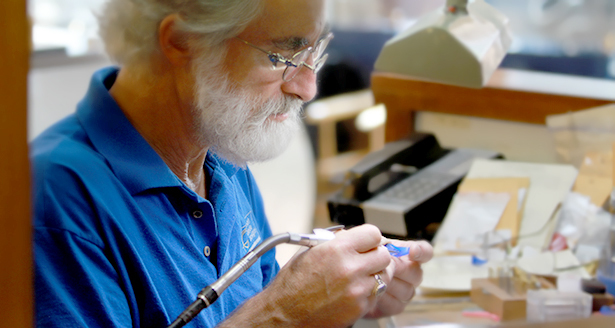 At Robert Giede Design, we specialize in handcrafting one-of-a-kind pieces of jewelry. Whether it's a special occasion or a gift for yourself, we can create the perfect piece that is as unique as you are. We are renowned for our ability to customize to individual taste, design, and physique. Personalized wedding and anniversary sets are our specialty. We have also created a vast array of items including rings, pendants, earrings, pins, cuff links, and bracelets for our clients. is a jeweler you can trust. Robert Giede is an accomplished designer and goldsmith who has been creating jewelry since 1973. He opened his first storefront in Menomonie, Wisconsin in 1976. Since then, the team has grown and together we have over 75 years of design and repair expertise. We pride ourselves on our fine craftsmanship and perform all work in-house. At Robert Giede Design you are not limited to a choice of mass-produced mountings, where you only select which gemstone to set. We will listen to your exact needs and wishes, creating a piece that is unique in all aspects of the design. There will be no other piece in the world exactly like yours. ring you will ever wear. Master goldsmith Robert Giede has fine-tuned his craftsmanship to assure that your new ring is perfectly suited to the unique shape of your hand. Our exclusive comfort fit rings are ergonomically curved to fit your hand specifically. The result is a beautiful ring that will not shift, spin, or bind. Our design is guaranteed to have a superb fit with unparalleled comfort.